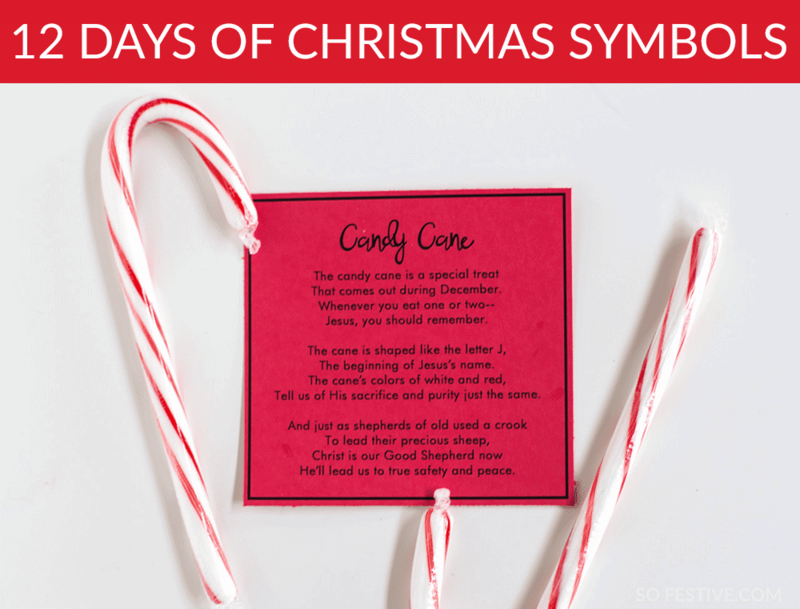 Easy 12 Days of Christmas Idea + Printables - So Festive! Looking for a simple and sweet 12 Days of Christmas idea? This original version is simple to put together and many of the gifts can be found at the grocery or dollar store. We’re all about simple gifts here at So Festive! And I know you’ll love this Sweet & Simple 12 Days of Christmas just as much as some of the other popular gift ideas here including the 12 Days of Christ, 12 Days of Christmas Just For Guys, or the Simple Hospital Survival Kits for New Moms and Dads. Who is this 12 Days of Christmas Great For? Glad you asked! If you’re looking for a gift for your neighbor, coworker, widow, or family, this version is perfect! The gifts are inexpensive and fairly generic. Plus, many of the poem tags have a few different gift options so you can tailor it to your gift recipient! I shouldn’t be surprised at how popular my mom’s Sweet & Simple 12 Days of Christmas Idea has been on Pinterest. If you are still in need of a simple 12 Days of Christmas for someone, use this! 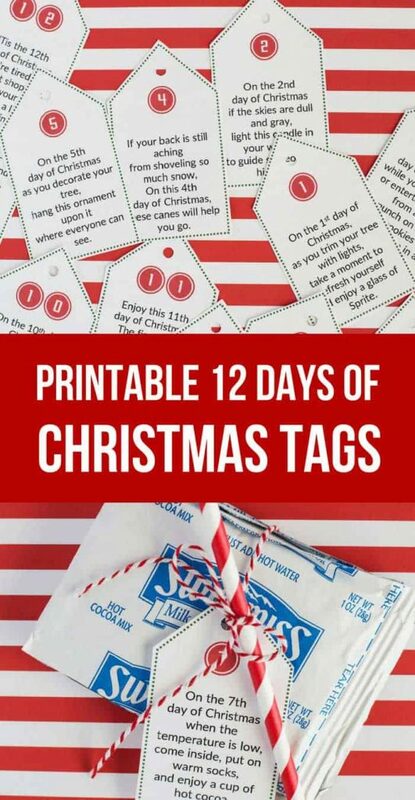 I’ve already got printable tags made for you and all the inexpensive gifts can be picked up at the dollar store or grocery store. What Makes it Sweet & Simple? For one, the tags are printable and ready to go! Each day contains a fun little poem that correlates with the gift for the day. All of the gifts can be found inexpensively at the grocery store or dollar store, making it affordable even when budgets are tight during the Christmas season. And let’s not forget the sweet part. Many of the gifts are yummy snacks and sweets that can be eaten now or saved for later. Day 11 says, “Enjoy this 11th day of Christmas. The fire snaps, crackles, and pops on top, Like the Rice Crispy commercial Snack, Crackle, Pop.” You can wrap up a gift of store-bought rice crispy treats or make a plate of homemade. You can deliver a gift each day, or put them all together in one giant gift bag and instruct the recipient to open one each day. Yes, these are pretty practical and useful gifts, but more than the gift part, the thought behind this Sweet and Simple 12 Days of Christmas means more than that. We’ve given this to widows, or most recently, a dear family whose mom has recently been diagnosed with cancer. My heart aches for them, as my own mother passed away from cancer when I was 15. We were the recipients of such thoughtfulness that first Christmas. So spreading some cheer and letting people know there is someone thinking about them can mean a lot! It’s not too late! Spread some festiveness and surprise someone or a family with the 12 days this year! Click here for more details and the printable tags! If you’d like to change up some of the days or gifts, (like if you don’t have snow, for example), you can grab editable tags right here that you can use over and over. Save BIG with our 12 Days of Christmas Bargain Bundle! The 12 Days of Christmas Bargain Bundle includes 7 versions of the 12 Days of Christmas for one bundle price. You’ll get: 12 Days for Guys, Sweet & Simple 12 Days, 12 Days of Christ (3 versions), 12 Days of Christmas Book of Mormon version, plus, 12 Days of Christmas for Missionaries. Is this easy 12 days of Christmas not quite what you’re looking for? How about one that is centered on Christ? Each day features a name of Christ with a coordinating scripture and simple, inexpensive gift to go along with it. Check out all the details here. Cookie Exchange Winning Sugar Cookie Recipe! Such a cute idea! I found this on Pinterest. Can you send me the editable version? Thanks! I would love the edible version as well. Such a cute idea! I ordered the 12 Days of Christmas tags twice and was unable to get the download. Please advise me as to what I can do.